These textured red-violet domes are really striking. Bold yet lightweight, with pure titanium posts and bodies for hypoallergenic longevity. These little titanium post earrings fit flat to the lobe with a centered hypo-allergenic titanium post. The textured rainbow is a nice bright accent, and the remaining pair is brighter than the pictured pair. Earrings colored to order with matching titanium flower clutches. Available in many colors. Anodized to order and come with matching titanium flower clutches. Pick your colors in the enlarged view to add to cart. By the pair and colored to order, these Earrings come with matching titanium flower clutches. Select your color. Much like the 5mm full-balls I offer, this half-ball is a full and elegant 5mm diameter and the post is ½" long. Hypoallergenic bullet clutches included. Note: These have a 1mm (18ga) stem, so flower clutches won't fit these. The ball is a full and elegant 5mm and the post is ½" long. Hypoallergenic titanium flower clutches included. If you've been shopping, then you know that these are a bargain! 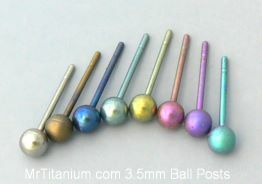 The platinum-colored ball is a full and elegant 6mm in diameter and the post is 1/2" long. Hypoallergenic flower clutches included. This ball is an astounding 8mm in diameter but they only weigh 1.3 grams (0.05 oz). Flower clutches included. Pairs Titanium Solid Disc Posts. This hearty disc is 5mm (3/16") across with a 1/2" long post. Hypoallergenic bullet clutches included (the posts are too thick for the flower clutches). Colored to order. This disc is a full 3/8" diameter (9.5mm) but looks thinner because it is tapered toward the 1/2" long post. Like the ball posts, they are milled from solid implant grade titanium for maximum safety and durability.